I could hear the grunting and groaning long before I cautiously came up over the dune top. When I did, there below me, stretched along the surfline of the beach were about 500 Grey seals. I lay flat, watching, and after taking some photos, retreated down the backside of the dune, came around the base and stepped out on the beach. Immediate panic broke out at the end of the of the pack, some seals charging into the ocean, others lumbering further into the herd, trying to put their neighbours between me and them. Maintaining what I thought to be an appropriate distance, I continued along the upper beach, attempting to get closer to the seals but the end of the herd kept peeling off into the waves. And then one exceptionally large male squared around to face me. I could see him thinking. I was, too — wondering if I’d crossed some invisible line and just how fast might this big guy be able to charge across the sand toward me. I slowly backed off to the base of the dune and sat down. He continued watching me but seemed to relax. Knowing I couldn’t get any closer, I broke out my watercolour gear and did the sketch that accompanies this text. 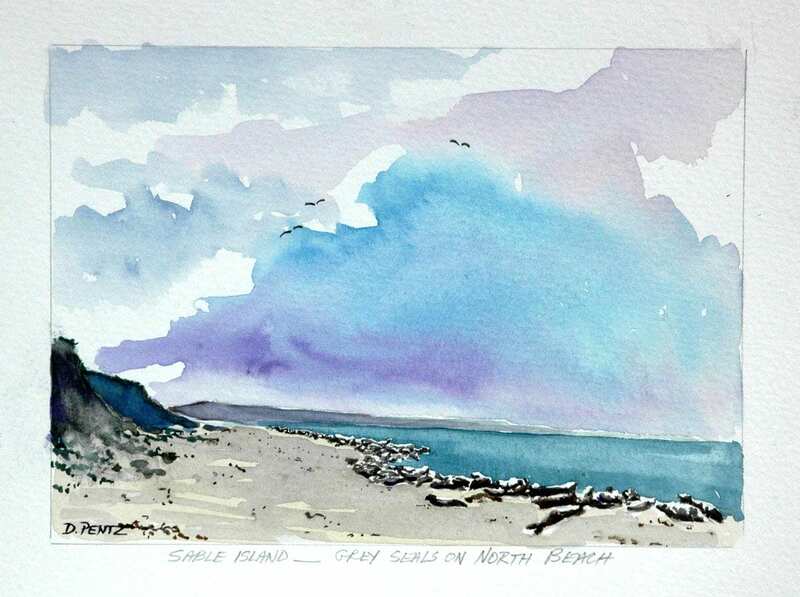 Over the six days spent on Sable Island, I completed 20 small watercolours. With each image I can recall the time and place — the wind, the smell, the lay of the land as I crested along the dune tops or circumvented the ponds — jewels of blue in the midst of green vegetation and buff sand. Watched by curious horses, I moved slowly, a drifter, content, trying to see and feel what this maze of dunes and waving grass had to offer. Like some exotic woman, briefly met and suddenly gone, Sable offered a tantalizing but beautiful image of itself. The encounter was all too short-lived.